What a great...and surreal... day for our family! Elias was so calm and comfortable with us last night and slept for over 12 hours. I didn't sleep nearly that long though because I was up half the night staring at this precious boy, this amazing blessing we'd been given. I had longed for this day for almost a year and a half. It was so hard to believe that our sweet son was actually in our room, in our care, beginning his new life with us - finally!! Elias really started to warm up to us today, and we had some great breakthroughs with him... a few smiles, some laughs and even a couple of words! There was one moment at dinner that Elias was actually being silly to try and get us to laugh at him! Its so exciting to see his personality start emerging. We also attended our visa interview today at the US Embassy. We were asked a series of questions, given some of Elias' official documents, and then were told these most wonderful words, "This adoption is now considered complete and final." I could barely catch my breath over the lump in my throat. Finally, officially our son. Thank you God!! Heading to the Transition Home this afternoon felt surreal. It was familiar, yet different. We had taken this same trip seven times before, but today would be our last time. We would leave the Transition Home today with our son. He would never again live in an orphanage. Praise the Lord for this day that we had so long prayed for! We arrived at the TH during nap time and as anxious as we were to hold our boy again, we decided to wait and let him sleep. We filled out all of our Embassy paperwork, met with the TH doctor, received Elias' medical records, and reviewed his daily schedules. Finally, we saw one little sleepy head up and out of his bed, and we knew it wouldn't be long before all of the toddlers started to wake up! Would he remember us? Would he be happy to see us? Would he cry? Anxiously, we waited. And then we saw him! He had gotten out of his bed and was walking hand-in-hand with a nanny, towards the door, towards us. For a moment he continued walking, but when he saw us there waiting, he broke free of the nanny and began to run.... in the opposite direction, back to his bed. We noticed immediately that he had started to cry. It broke this mommy's heart to see him so upset to see us, BUT he knew that we were there for him. He recognized us!! One of my great fears was that he wouldn't remember us and that we'd be starting all over again, but he actually remembered us. After the nannies changed him, they handed him out to us, and that was it. He was ours. Forever. The feelings of excitement and rejoicing were ours alone. Our son was leaving everything he knew: his home and the people he loved. He was being taken from all that was comfortable and familiar to him and being placed with people who didn't look like him or speak his language. It was extremely overwhelming to him and he responded by becoming withdrawn and reserved. It was so hard to put him through all of these changes at once. It was heart-wrenching to see him so confused and overwhelmed, and even though his emotions and reactions were exactly what we had expected, it didn't make it any easier. Leaving the TH for the final time. Let me start by saying that you would be wise to not ever ask me to be your partner on the Amazing Race... I crack under pressure! Last night we had dinner with my parents, prayed over our trip, and kissed our girls good-bye. It was surreal to be leaving them again and knowing that when we saw them next, we would (finally!) be a family of six! This morning we woke up (actually, I don't think either of us slept enough to really have to wake up), packed our final items, and met our friend Ronnie in the driveway in the wee, dark hours of the morning. We arrived at the airport with plenty of time to spare and joined the other passengers in the check-in line. I was feeling positively giddy at this point! Were we seriously at the airport on our way back to Ethiopia to pick up our son?!?! We were standing in line, ready to check our bags, when one of the airline employees loudly asked, "Is anyone here heading to Washington, DC?" Yes! We were. We raised our hands with several of the other passengers, and she asked us to step to the side. "Your flight has been cancelled," she said casually. She asked us to give her our names and then she'd tell us when the airline had rescheduled us. At first, I really wasn't worried. I figured that we'd just get on the next flight to DC and still make our flight to Ethiopia. BUT THEN.... the two passengers in front of us were told that they had been rescheduled for flights tomorrow. Tomorrow?!? There was no way that would work for us. I knew how few flights Ethiopian Air had available into Ethiopia and we were lucky to be on the one we had... the one that left today. There was no way we could get into DC tomorrow. We wouldn't have a flight into Ethiopia. We'd miss our Embassy Appointment to get Elias' visa. I began to panic and instantly burst into tears. Yep, that's the way I roll. Tears. When it was our turn, the not-so-lovely airline employee said simply, "We weren't able to reschedule you because today is the only day for your connecting flight to Ethiopia. There's no other way to get you there. We've cancelled your ticket. You'll just need to head home." Waaahhh!!! Serious sobbing at this point. I called my parents, bawling, woke them up and asked them to pray for us. I was just devastated. One of the other passengers asked where we were trying to go, and I choked out that our son was waiting for us to come and get him in Ethiopia, and that he had already waited long enough. Bawling, pacing, wringing my hands... none of it helpful, but it was all I could do. My dear husband, on the other hand, kept such a cool. I don't believe he could stomach the idea of having to tell me that we weren't going. He went right to work exploring other options. He ran around the airport looking at the departing boards and saw that there was another airline going to DC shortly. They were flying into Reagan, and we needed to be at National, but we would at least be in the right city! He quickly got us new tickets, checked our bags, and with a brief 10 minutes to spare, we went running through the airport to catch our new flight! Thank you, God, for my level-headed, problem-solving husband! We arrived in Washington DC, collected all of our baggage, and hired a taxi for the 45 mile drive to National Airport. We got there just.in.time to catch our ET Air flight to Ethiopia! I don't think I started breathing again until we were in our seats, ready to depart to Addis. The rest of our trip was, thankfully, uneventful. We arrived in Addis on time, saw our good friends, David and Job, waiting for us, and felt instantly grateful to be back. The familiar sights and sounds were so comforting. We were finally back in the same country as our son. We went to the guest house to check in, unpack and shower. David, Job, and Yonas picked us up an hour later for lunch and then it was time to head to the Transition Home to pick up Elias for our "Gotcha Day!!" Whew... what a week it has been! My brother once said after reading this blog that my emotions on here are all over the place. And let me tell you, its not just here on the blog. My emotions truly are all over the place, especially as we have entered this final stage of our adoption. (Doesn't this make you feel some serious sympathy for my husband??) Its a constant struggle between feeling excited about being so close to bringing our son home and yet feeling heart-broken at being so far away from him. Last Friday, we got a call from our adoption agency that the embassy had opened our case for an investigation, and that they were requiring some additional testimony from our son's birthmother. It seemed that we were randomly chosen since there was no reason or explanation given as to why they needed this additional testimony or why the testimony she had already given in the Ethiopian courts or the testimony she had given to our adoption agency was not sufficient. It all seemed so senseless and cruel, and was the hardest news we had received throughout this entire journey. I was absolutely heart-broken for her to have to endure yet another round of reliving her loss, and I was heart-broken for us that we were being delayed in going to get our son. We had already purchased tickets to leave for Ethiopia the following morning, but these embassy investigations can take up to 12 weeks to process, and our adoption agency felt it would be too risky to travel at this point. Devastated is about the only word I can find to describe the way it felt to be told that we were not cleared to pick up our son. We had our bags packed, schedules cleared, childcare worked out, and hearts set on finally picking up our son and bringing him home.... it was a total bawling, sobbing, melt-down kind of day. Our agency worked quickly to arrange travel for our son's birthmother to come to the city, and she was able to testify at the embassy on Wednesday morning. We are eternally grateful for the many sacrifices she has made for her son and in awe of her strength and courage. Defying all expectations, the embassy cleared our case right on the spot, as soon as she had completed her testimony. We received the call this morning that the embassy had approved us to travel!! We were shocked... elated... overjoyed... thrilled to know that it was finally time to bring our son home FOREVER!!!! We leave on Sunday, February 27 and will have a March 1 embassy appointment to receive Elias's visa!!! OUR SON IS COMING HOME!!!!!! We leave in just three days to go get our sweet boy!!!!!! To our dear friends and family who have prayed us through this entire journey... we are incredibly humbled and grateful for your love and support!! Yesterday we got our miracle!! We had prayed, along with so many of you faithful prayer warriors, that we would be submitted to the embassy yesterday. We were up against some pretty steep odds, with MOWA being closed last week, but our God is bigger, and we are praising Him, the One from whom all blessings flow! Our file is now in the hands of the embassy, and we are finally nearing the end of this journey!!! I am embarrassed to admit that as the morning turned into afternoon yesterday, I began to doubt and my faith in this miracle began to waiver. I had prayed and prayed that God would allow us to be submitted to the embassy and when I hadn't heard anything from our agency by 1:00, I began getting worried, discouraged, and frustrated. Around 3:00, I checked my computer and saw in my e-mail inbox these words... "Embassy Paperwork Submitted." Simple. Direct. To the Point. Our miracle. Our answer to prayer. Thank you, Jesus, that despite my impatience and lack of faith, you answered our prayers in such a mighty way! You have redeemed Elias's life. He is no longer an orphan. He is our son, and You are now paving the way for him to come home! What happens next? It will take the embassy up to a week to review our file. If all of our documents are in order (and we are assuming they are), then they will clear us to travel and bring Elias home. We will know for sure next week, but we are currently planning to be in Ethiopia during the last week of February!! Baby boy, we are coming for you SOON!!! still feeling so far away. When we passed court on January 18, we were told that it would take 1-3 weeks to gather all of our post-court paperwork and submit our file to the embassy. Our agency can only submit files to the embassy on Wednesdays, so we were (unrealistically!) hopeful for the best case scenario of January 24. This date came and went without any news and we were told that they fully anticipated our file to be ready on the following Wednesday, February 2. I woke up on the morning of February 2 with all the anticipation and excitement of Christmas morning! I couldn't wait to hear that we had been submitted to the embassy. I stalked my e-mail all morning. And finally when I couldn't stand the waiting any longer, I e-mailed our adoption agency. Unfortunately, our file still wasn't ready. We were apparently missing one signature. The Ministry of Women's and Children's Affairs (MOWA) needs to sign off on all of our post-court paperwork, and it hadn't been done yet. I was just crushed. I miss our son desperately. My heart aches for him to be home with us. I want nothing more than to hop on that plane and go get him. I cried for him. I cried for me. I cried for the frustration of this whole situation. The very next day we received an e-mail from our agency that said that MOWA had decided to close for a week in order to relocate all of their files (yikes!!) and that our file would most likely still not be ready on the next Wednesday, February 9. That news was just about more than my heart could take. I fought with some serious discouragement and disappointment this day. In my logical head, I know that God's got this, and I'm just along for the ride. This is all in His timing and His plan, and we have chosen to simply take His hand and follow along. It doesn't mean that its easy, though. We are waiting on Him with the full trust that His ways are best, even when they aren't our ways. Waiting on Him means that I am not in control and that is a hard lesson that God's been teaching me throughout this journey. I am trying to find strength and patience in this time of waiting, and trying to do it gracefully. But it hurts. I long, I ache, I am desperate for our son. Its time for him to be home. We are praying for a miracle this week... that our file will be ready to be submitted this Wednesday, February 9. Will you join us in praying? And if our file isn't ready, and we have to wait another week, I pray that we will do it praising Him along the way. Meeting Elias was one of the most amazing moments in our lives. We are so blessed that God chose us to be his parents, and we cannot wait to bring him home! We are currently a family of five, striving to follow God's calling in our lives. We hope to soon to be a family of 6! We've created this blog to document the amazing journey we're on to bring our son home from Ethiopia. Click on the image below to learn more about our decision to adopt. "By adopting a child and helping them reach their potential, they help us reach ours. An adopted child is not an unwanted child; to the contrary. They are a child who was searched for, prayed for, cried for, begged for; received by arms that ached, making empty hearts full. Love is... meant to be shared." August 24 - On Deck! September 24 - Number ONE on the waiting list! January 15 - Meetcha Day!! January 18, 2011 - We PASSED court!! Elias is officially our son!!!! February 28 - Gotcha Day!! 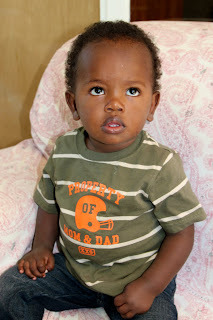 March 6, 2011 - Elias is forever HOME!!! My name is Laura. My husband, Charlie, and I have been married for 10 years and have been blessed with three daughters; Emma, Ellie and Erin. 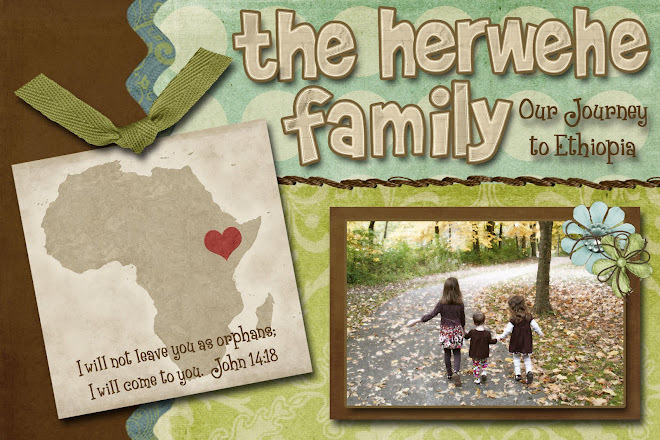 We are currently in the process of adopting our fourth child, a son, from Ethiopia. We are excited to be on this journey and hope you'll follow along!